Little Pond, Maine, October 10, 2008. The reflection makes the color so much more rich. The moon is a bonus. Very nice. wow! this is so nice, tom! loved those reflections of colors! What an interesting and beautiful shot. It's one that begs to be looked at a little more closely. Wow...you have captured the best of both worlds! My SWF photos are posted here and here. Please stop by if you have some time. Thanks! What a perfect capture. So serene. My post today has the same title - great minds think alike? I'm envious that your view includes water. Good stuff you do. Beautiful area you photograph. The reflection of the moon is great! So beautiful! You captured a great sky watch. Terrific shot, Tom! How neat to get both and the great reflection as well. I love your photo it is amazing. Oh wow! This is truly impressive. The moon's tiny reflection in the dark pool is really amazing. 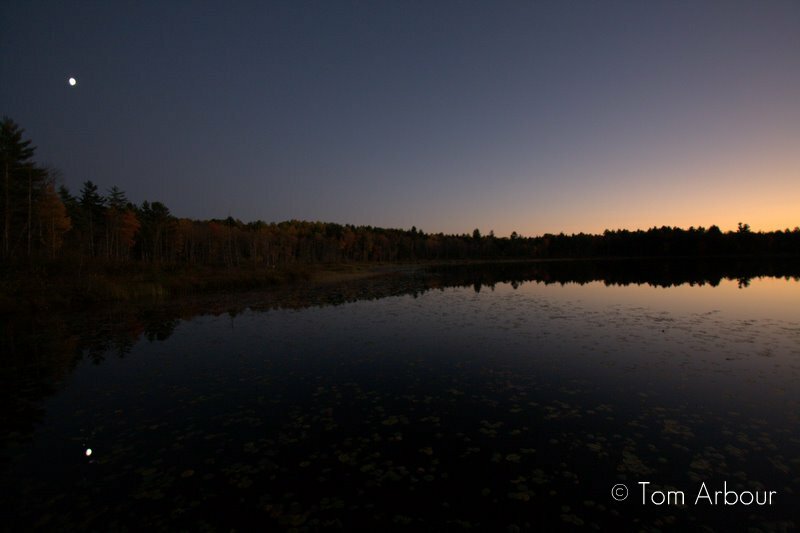 Tom: Neat sky capture at the pond. Maine was a great place for sky shots. It's rhapsody in blue sky and water in perefct harmony. Thank you every one and happy Sky Watch. The more I look at this image, the more I want to keep looking at it. What really made it work was shooting with the ultra wide Canon 10-22 efs lens. That enabled me to get the full view from moon to sun. The reflection is great, I like that you captured two separate things - moon & the sun. I can't say I've seen too many like this. This photo really has a cool feeling to it, great job. Please check my entry here. Lovely clear photo with great reflection. Happy SWF. beautiful picture... must have been like forever waiting for that moment. but may i ask, at what time did you take this photo?